Sleek townhome w/patio - walk to amazing restaurants, breweries, trails & shops! 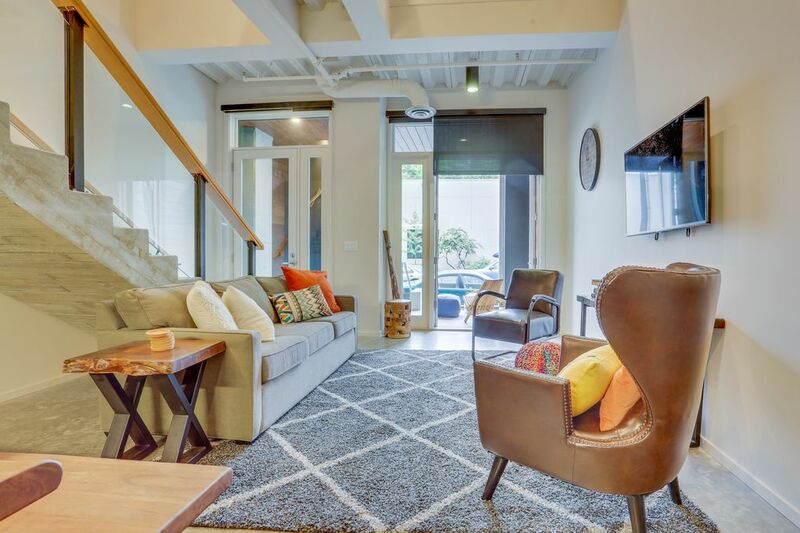 Discover a contemporary urban escape at this two-bedroom Northwest Portland townhouse, a luxurious property with a private patio and an unbeatable location close to restaurants and breweries. You'll find this lofty, two-level space in the Q21 Building, a modern and elegant building in the Slabtown neighborhood of Northwest Portland. You'll be just a couple blocks from a New Seasons Market, a beloved outpost of Breakside Brewery, countless boutiques and cafes on NW 23rd Avenue, and an incredible selection of restaurants from St. Jack to Ataula. The interior living space is bright and breezy, with a chic industrial design that makes creative use of glass, natural wood, and cement. Bask in the central AC on even the warmest of summer days, or open the glass doors to get the crisp evening breezes flowing throughout the space. Begin each morning with a warm croissant from St. Honoré six blocks away, and a cup of French-pressed or drip coffee in the full kitchen. This cool and compact space offers sleek appliances (including a dishwasher), an island with additional prep space, and an adjacent six-person dining table made from unrefined wood beams. Grab a copy of the Willamette Week and head outdoors to the front patio, where you can watch the world go by from one of the two lounge chairs. Spend your days hiking in Lower Macleay or Forest Parks, both of which can be accessed one mile west, and come home to refresh your hiking wardrobe in the private washer/dryer. If you're staying in for the evening, you'll have a flatscreen TV for catching your favorite movies and a communal game room on the second floor with Ping-Pong and pool tables. Head upstairs to discover two queen bedrooms that are connected by a bridge-style walkway. You'll find French doors that let in the sunshine in the front bedroom, a small workspace next to the back bedroom, and a sofabed for additional sleeping space in the living room. Whether you're a regular visitor to Portland or spending your first vacation in the Rose City, you'll be in the midst of an exciting, creative neighborhood in Slabtown. Shop for your groceries like a local at the New Seasons around the corner, taste Portland's most delicious IPA at Breakside Brewery, sample outstanding Spanish tapas and paella at Ataula, and sit down for a French bistro dinner at St. Jack. Find the Wildwood Trail in Lower Macleay Park and follow the path to Pittock Mansion, where you can glimpse an incredible view of Portland and Mt. Hood. Just be sure to leave at least one afternoon to wander NW 23rd Avenue, stopping for a world-famous ice cream cone at Salt and Straw, a sugary treat or two at Blue Star Donuts, and a lovingly made espresso at Barista. You'll be in the center of it all at this stylish Northwest Portland townhouse - book your unforgettable stay today! A garage remote will be provided in the unit. You will need to obtain the keys first from the lockbox located in the lobby, and then pick up the remote from inside the unit. Once you have the remote, you will be able to access the garage for parking. There is a total replacement fee of $200 for lost remote. Everything about the place met my needs for a home base while in Portland. It was clean and comfortable. THX! Everything you could ever need for a wonderful Portland stay! Spacious and modern with striking architecture. Great location, close to stores and restaurants. We loved the condo. It was so comfortable and clean. It had everything we needed and we cannot wait to stay again. We traveled to Portland as a family of 4 and enjoyed the townhouse in Nob Hill. We were very comfortable with the accommodations, being very well-equipped. We walked to great restaurants, bakeries, coffee houses, and grocery stores.